Americans love refrigerators. They even give them a nickname: "fridge." Almost 100% of homes have a refrigerator, according to government data. It's the most popular home appliance. But here's an even more telling stat about the American love affair with this appliance: nearly 1 in 4 U.S. homes have two (or more) fridges. If you're wondering what people do with so much fridge space, look no further than social media app Instagram. There are over 340,000 Instagram photos right now with the hashtag "fridge." People (mostly Americans) can't wait to show the world how they decorate their fridge with magnets and art or how they fill their fridge with beer or vegetables. Some people even photograph themselves just standing by the fridge, similar to the way you might take a selfie with a trophy or hot car. The U.S. Energy Information Administration has been tracking refrigerator use by Americans because older fridges need a lot of energy to run. "Open your refrigerator door and you summon forth more light than the total amount enjoyed by most households in the 18th century," wrote best selling author Bill Bryson in his book "At Home," which chronicles the changes in domestic life. American fridges are big, especially compared to what's used in Europe, Japan and elsewhere in the world. 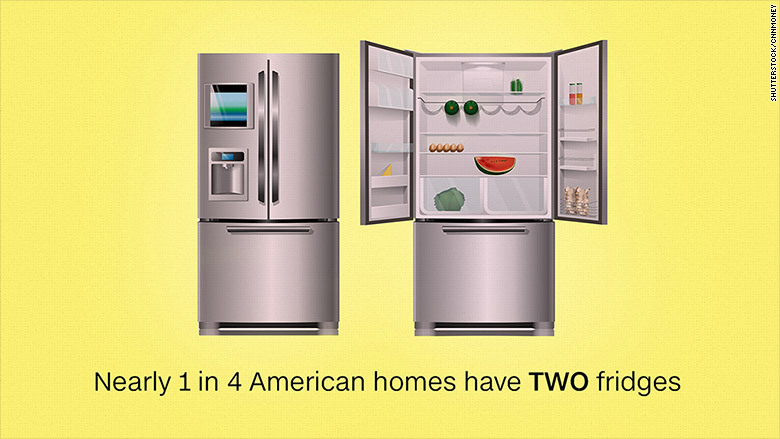 Nearly all U.S. fridges have at least two doors. Less than 5% are considered "small" (under 14 cubic feet). Sales of refrigerators plummeted in the Great Recession, but there's been some rebound and retailers are hopeful for more of a bump now that home sales and construction are hot again.